A Moveable Beast: Montreal: Crazy Exists Here Too! Montreal: Crazy Exists Here Too! I always think it's really funny when Americans talk about how Montreal is so "European." I understand that a year spent in Paris does not give me the right to be snooty about Quebec, but I do have a bit more perspective than I used to, and I must tell you, Quebec is not France. Yes, people speak French, but it's not like any French I knew on the other side of the Atlantic. This morning, it took 5 replays of a voicemail message for me to grasp that something we ordered "has arrived" and "have a good day." I still don't know what we ordered, where it has arrived, or what I'm supposed to do about it. Despite having been exposed to it from an early age, Quebecois French still sounds crazy to me. Vowels get stretched in strange directions; syllables appear where they need not be; the language has its own counter-intuitive rhythm. To me, it sounds like normal French, but drunk... and on a trampoline. You will not find these things in France, which is probably for the best. And there are plenty of French things that you will not find in Canada. This is how it should be. One France is enough. One Canada is enough. There is overlap, however. For example, yesterday I was at a stop light in Montreal. I heard a quiet, high-pitched voice begin to chirp from the car next to mine. It started low, and then got louder and more persistent. It wanted attention. I tried to stay focused and ignore whatever madness was going on beside me, but I finally gave in and looked over. It was a taxi driver, and he was on a roll. Delighted by the attention, he began to coo with even more zeal... it was a mysterious melody that blurred the line between classical opera and reggae. And then it happened... I experienced that old familiar thrill I used to feel in Paris when I was harassed by a crazy person, or when a drunk guy singled me out on a crowded street. It felt... comforting? So, no, I'm not in Paris anymore. But the good news is, crazy guys are a global commodity, and absurdity is a universal truth. 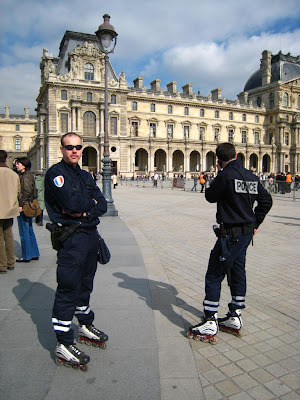 On a different note, who do you think would win in a fight between a Parisian Roller-Cop and a Canadian Mounty? What I was in Montreal at the age of 14 it seemed like Quebecers(?) were the ones who were all, "We're just like Paris!" Of course, we were only doing touristy things, so it's possible they were only giving Americans what they wanted to hear. 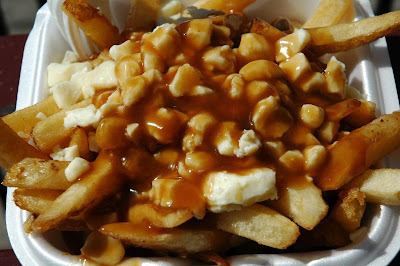 Also--holy cow, I love poutine! I'll take the Mounty over the Roller Cop any day. Hello?! The roller cop would be distracted by a nearby terrasse with an empty table and wander off for a leisurely glass of wine. 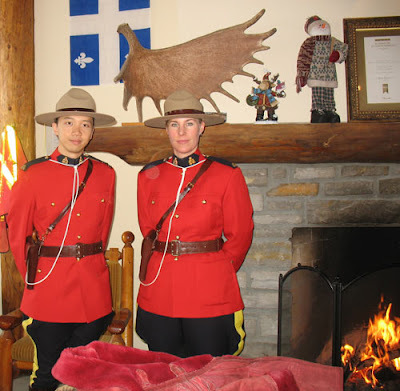 Or the Mounty could just beat him with his hat.